Western blot analysis of whole cell lysates probed with HSP90B1 antibody followed by detection with Goat anti Rat IgG:HRP (Mouse Adsorbed) (1/10,000, STAR72) and visualized on the ChemiDoc MP with 119 second exposure. Arrow points to HSP90B1 (molecular weight 100 kDa). HSP90B1 antibody recognizes 94 kDa glucose-regulated protein, also known as GRP94, endoplasmin, stress-inducible tumor rejection antigen gp96 or heat shock protein 90 kDa beta member 1. Rat anti HSP90B1 antibody recognizes 94 kDa glucose-regulated protein, also known as GRP94, endoplasmin, stress-inducible tumor rejection antigen gp96 or heat shock protein 90 kDa beta member 1. This gene encodes a member of a family of adenosine triphosphate(ATP)-metabolizing molecular chaperones with roles in stabilizing and folding other proteins. The encoded protein is localized to melanosomes and the endoplasmic reticulum. Expression of this protein is associated with a variety of pathogenic states, including tumor formation. There is a microRNA gene located within the 5' exon of this gene. There are pseudogenes for this gene on chromosomes 1 and 15 (provided by RefSeq, Aug 2012). 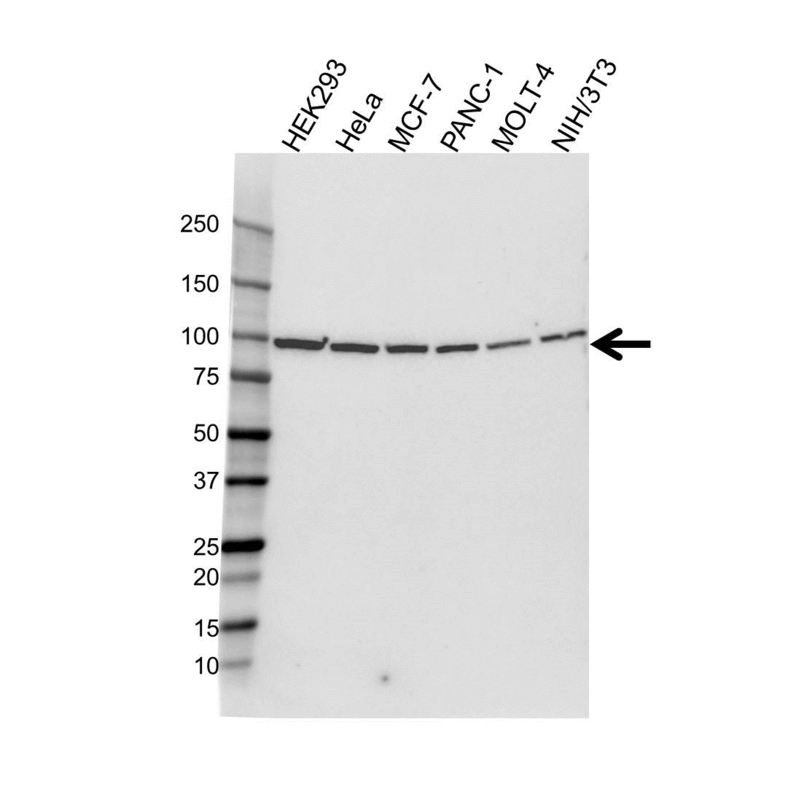 Rat anti HSP90B1 antibody detects a band of 100 kDa. The antibody has been extensively validated for western blotting using whole cell lysates.